If your interest in the X-Men has diminished, Extermination is undoubtedly the book to bring you back to a Marvel staple. Extermination marks (another) new beginning — and in some ways, an end — for the X-Men’s current run. Soft reboots, hard reboots, and everything in between has become the norm for the multiple X-Titles popping in and out of Marvel’s circulation like Whack-A-Moles. Death and Rebirth have become the standard. With the ubiquitous “I got better” quips as a reply to the far too common question of “weren’t you dead?”. Long-standing members of the X-Men have had their character marred by questionable decisions, and even more questionable writers. Despite all this, the X-Men are a team with a long-storied past and remain a critical part of the greater Marvel Universe. Older fans will have fond memories of how mutants dominated comic shelves throughout the ’90s; holding out hope for a return to form. A five-issue mini-series isn’t enough to put those worries to rest, but this book is a definitive step in the right direction. Extermination manages to bring out the best aspects of Marvel’s Merry Mutants while simultaneously righting the wrongs of recent memory. Extermination may very well be the best X-Men storyline of 2018. More so than your average title, X-Men continuity is as convoluted as it comes. The crux of Extermination’s story falls squarely on the shoulders of the original team of time-displaced X-Men; teenage versions of Cyclops, Jean Grey, Beast, Ice Man, and Angel. For fans who haven’t been in the loop, you have a lot of catching up to do. Like so many comic book stories, the current status quo is the culmination of several years of plots coming together. The X-Men have been pushed to the brink with the mutant race nearing extinction. One questionable decision after another has shown the level of desperation among the team members. The breaking point came when Cyclops — possessed by the Phoenix Force — murdered Charles Xavier. The team has never been the same since. A disenchanted Beast took it upon himself to travel back through time to bring the teenage versions of the original X-Men to the present in an attempt to scare the young Cyclops straight, preventing his descent into immorality. The title picks up in the present day; the young X-Men have continued their fight for mutant-kind, building new experiences and memories along the way. Ahab, the mutant hunter from a dystopian future, has come to the present to kill the time-displaced X-Men. He now has two young mutants under his thumb that can manipulate emotions and memory, posing a more magnificent than ever before. Equally, a mysterious figure has taken out a former X-man with ties to the original team, following up by kidnapping the anachronistic adolescent mutants for an unknown purpose. It quickly becomes all hands on deck as several X teams come together to face threats on multiple fronts, and save their counterparts. With so many moving parts, it would be nearly impossible to critique Extermination without spilling some information. You’ve been warned… MINOR SPOILERS ARE AHEAD. First and foremost, writer Ed Brisson adds gravitas to Extermination. Granted, the press releases and solicitations leading up to the mini-series was implying as much, but Brisson did not disappoint. In decades past, X-Men stories always felt epic, a sentiment that has waned over the past several years. Nevertheless, instead of coming off like another drop in the bucket, Extermination tactfully addresses the past several years of mutate drama and feels like a must-read. The young X-Men’s continued strain on the timeline? Check. Beast’s culpability in bringing the team to the present? Check. Bobby Drake’s self-discovery? Check. X-Force’s “methods” of handling threats? Check (to a degree). Moreover, fans knew it was only a matter of time before the O.G. five returned to their original time. However, a clever plot twist (and exciting use of Jean’s powers) ensures that Beast, Angel, Jean, and Hank’s exploits haven’t been for naught (more on this later). There are several characteristics the X-Men bring to the table: the mutant metaphor for real-world intolerance, a group steeped in heroism, relevant themes, and a crucial team dynamic. Extermination does not overlook the team chemistry aspect. Dialogue is fun, natural, and is always fitting. They may be facing imminent danger, but the humor remains. Would this be a team book without some turmoil? Jean Grey wants the young team to seek asylum from Ahab and the mysterious kidnapper, while the elder statesman finishes the fight. It doesn’t sit with teen Cyclops, and why should it? It is his fight too. Brisson manages the conflict with ease. Neither side feels as if they are in the wrong, they merely are approaching the matter from a different — yet respectable — perspective. Regarding the story, every issue is thoughtfully paced. The action (and there was plenty of action) is balanced with the over-arcing plot. The character arc’s themselves, namely the young team resolving to return to their original time, was equally as nuanced. Every issue in the trade is significant in addressing the Extinctions storyline in and of itself while also making more significant strides in the greater X-men Universe. 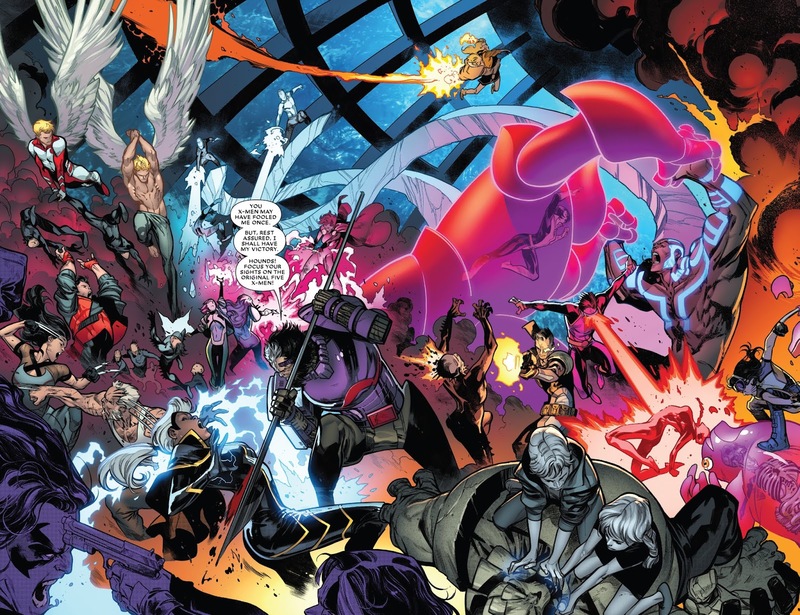 An X-Men book wouldn’t be complete without intense action and massive battles, and Pepe Larraz was born to draw our titular heroes. Every panel, every splash, every detail is thoroughly created. Throughout the entire read through, fans will find one awe-inducing splash page after another. Domino will be emptying a full clip in the foreground, young Cyclops is firing an optic blast in the mid-ground, while two Ice Men (Young and Old) freeze a hell-hound in place. Several pages in the book could be posters. On a more intimate level, Larraz has complete control of rendering sentiment and reaction. The book has a bevy of ups and downs emotionally, and Larraz tackles the emotional weight of each scene with aplomb. Cannonball’s expression as he is shocked by the aftermath of a battle, Honey badger’s frothing at the mouth with adrenaline-fueled vitriol, and heads hung low at a funeral. Brisson’s words are indeed brought to life by Larraz’s steady hand. While the past five years of X-Men stories have been focused on the past, the X-Men can finally start focusing on the future that they’ve been fighting to protect all along. I’ll leave several of the revelations for readers to discover for themselves. Satisfyingly, several ongoing stories are addressed. Bendis’s exploration of the Young X-Men in modern times is brought to a close, but the impact they’ve had over the past five years remains relevant. It remains to be seen just how much of an effect those newly formed memories will have on the original team, but the possibilities are enough to warrant a continued reading of the X-titles. Sadly, some team members are laid to rest. Death is only temporary in the comic world, but from a story standpoint, the loss should resonate for some time. Finally, a fan-favorite makes a triumphant return, the possibility to explore how the X-Men will be affected remains ambiguous, but it will be glorious. Extermination works on so many levels, proving the team is equally as compelling as anything Marvel has to offer. If your interest in the X-Men has diminished, Extermination is undoubtedly the book to bring fans back to a Marvel staple. Inherent to all team books, some of your favorite characters may not get enough "face time"